The lovely Chrissie over at Vamp It Up Manchester was kind enough to nominate me for the Mystery Blogger Award! Thank you so much Chrissie! Chrissie shares edgy styles (a personal favorite of mine), cruelty free beauty, as well as vegetarian meals and restaurants she and her bloke try out. You should really check out her blog! My hair has been several “unnatural colors” including purple, blue, cherry red, and green. Red was my favorite. I was proposed to in a castle in Ireland, and it was one of the most magical moments in my life. I have the cutest long haired chihuahua named Padme. She just turned 6 years old! Would you rather be a famous super hero and have lots of vague friends OR be the normal you and have a few close friends? I would rather be the normal me with a few close friends. I lean on my close friends when I need them, and I love doing the same for them! How has your blogging style changed since you started and why? When I first started blogging, it was mostly a way to blow off steam and get some things off my chest, much like a journal. 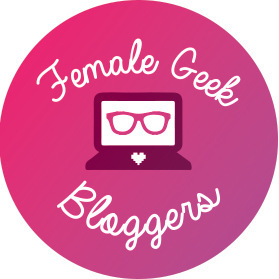 When I decided to move from blogger to WordPress, I revamped my branding and secured my place in my niche as A Geeky Gal. If you could make a pizza OR a milkshake/smoothie and add ANY ingredients to it (no judgment) what would you make? I get crap all the time about my favorite pizza: pepperoni and pineapple. I worked at a pizza place for years and have made all kinds of combinations. Pepperoni and pineapple is one of my favorites along with Buffalo Chicken, hold the hot sauce, add mild sauce and BBQ sauce with extra onions. So freaking good. What is the most important thing in the world to you? Alec, my husband. What decade do you feel suits your personality and style the most? The 90’s. I love the grunge style and jeans. You’ll catch me at any time of the year in jeans and t-shirts. What game or gaming moment made you laugh the hardest? Which character (from a games, book, TV show) would be your best friend and why? What life skill(s) have you learned from playing video games? How did you pick your gaming username (or forum username)? (weird) We’re going to hang out today. What do you pick for us to do? I also would rather be normal and have my best friends. I love my friendships and I treasure them. Thank you so much for nominating me! Looks like we agree on a lot of things haha. You’ll have to get you some girls to hang with! If we want so far apart I’d totally hang out with you! I love the sounds of your hair colours in the past. I’d really like to dye my hair some unnatural colour but I never have. I’d also be so sensible with wishes, I’d love to say I’d wish for whatever but I’d end up picking something sensible. I used natural dyes so that they wouldn’t have my hair but the downside is they were a lot of upkeep because natural = likely to wash out. If you have a job that doesn’t care about your hair color, I’d definitely give some temporary hair dye a try! It’s so much fun! And curse being responsible all the time haha. I’m always sensible. I might try that at some point but job stuff may not be 100% certain depending on a few things so I might leave it until next year at least. I know sometimes I hate being so responsible. I’m debating buying some things and my responsible nature says why you should just keep saving and my other part goes oooh I want. So far responsible side is winning haha. It’s great being sensible and responsible but a bit dull at times. Thanks for the nomination, I’ll try and write my response as soon as I can! Love that your fiancé is Irish. (Not biased or anything). I love it too haha!